This 300 large piece jigsaw is designed by Kay Lamb Shannon and measures 46 cm x 61 cm. The apple orchard is populated with people looking to pick apples or pick up various apple treats. Each 300 large piece jigsaw puzzle is designed by Kay Lamb Shannon and measures 46cm x 61cm. Available in two sizes. 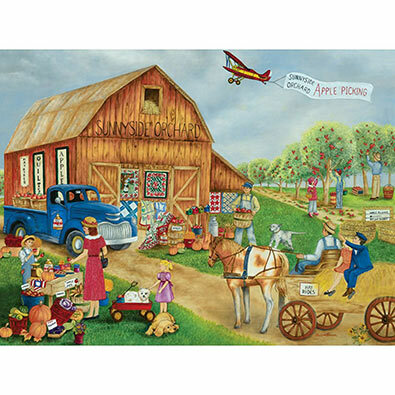 This 300 large piece jigsaw is designed by Kay Lamb Shannon and measures 46cm x 61cm.